API statistics show that a barrel of oil shipped by pipeline safely reaches its destination 99.999 percent of the time. For natural gas, PHMSA recorded less than one “serious” incident per 100,000 miles of distribution pipeline in 2017. While unlikely, incidents happen. When they do, the cause tends to be corrosion, base material/weld failures, or equipment malfunctions, according to PHMSA. Getting to the root cause of problems and reducing safety risk is the purpose of pipeline integrity management, which includes periodic inline inspections and non-destructive testing (NDT). Each system operator has its own inspection procedures, but smart pigs are generally run in 60- to 100-mile segments. The inline data is analyzed to identify anomalies that might indicate potential trouble spots that warrant excavation for additional inspection. That’s where NDT service providers such as XCEL NDT LLC come in. Pig data locates a possible anomaly, but like an “industrial doctor,” it’s up to the NDT technician to investigate it, diagnose it and figure out why it occurred so the operator can take corrective action. Inspection begins with visual examination and progresses to applying specialized techniques to assess a pipeline’s overall health by analyzing a sampling of the soils, coating, base material, long seam welds and girth welds. External corrosion is a common problem on buried pipelines. Another serious related issue is stress corrosion cracking (SCC), which is unpredictable, but can progress rapidly. Consequently, a major focus of NDT services is evaluating the effects of corrosion. Virtually all pipelines have cathodic protection to mitigate corrosion. NDT technicians use pipe-to-soil potential to measure cathodic voltage and specially calibrated probes to determine soil composition, moisture, pH and resistivity levels–all of which influence corrosion. Micro-biologically induced corrosion (MIC) sampling identifies corrosive bacteria and fungi in soils. This information on environmental conditions and pipe/soil chemical interactions at burial depth helps pipeline engineers remediate problems and optimize cathodic programs. Evaluating the structural integrity of the pipe itself starts with visually searching for mechanical damage, oxidation, arc burns, etc. The next step is inspecting the condition of the corrosion-inhibiting chemical surface coating. Magnetic particle testing (MT) and dye penetrant testing (PT) are standard inspection tools to detect surface abnormalities and identify lack of fusion in welds. 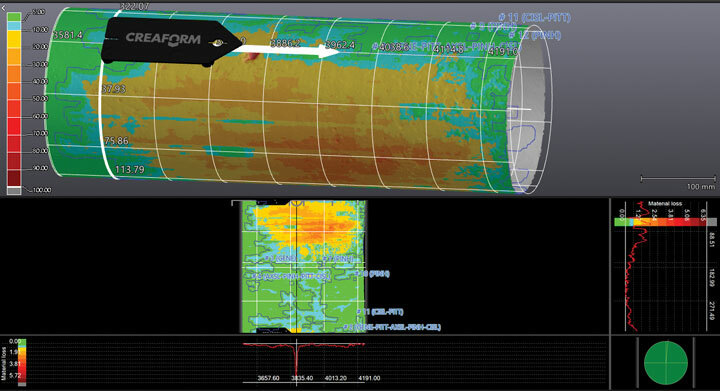 Examining below the surface requires ultrasonic devices that use high-frequency sound. The energy loss reflected from areas with discontinuities causes amplitude decreases in the ultrasonic echo. Like a doctor using sonography, ultrasonics enable the technician to “see” beneath the exterior to volumetrically size corrosion, pitting, cracks, laminations, etc. Ultrasonic pencil probes that use compression-wave ultrasonic signals to acquire precise dimensional measurements are one of the tools utilized for mapping corrosion and calculating pipe wall thickness. Automated ultrasonic testing (AUT) automates the ultrasonic mapping process with a high-speed robotic sensor that generate a 360-degree digital representation of the pipe at a resolution as high as 0.10 x 0.10 in. AUT data can be archived for time-lapsed comparisons. Shear-wave ultrasonic testing (UTSW), which introduces sound signals into the pipe at a predetermined angle (rather than a straight beam) to obtain a maximum acoustic response. Angled-beam transducers provide accurate wall depth/metal loss measurements, and detection of longitudinal fissures (including SCC) and weld defects. Phased-array ultrasonic testing (PAUT), which is essentially the same technology as a sonogram, enabling the ultrasonic beam to be “steered” at angles ranging from very sharp to very shallow. This is particularly useful in examining linear discontinuities. Mid-range ultrasonic testing (MRUT), which sends a guided-wave ultrasonic signal axially along the length of the pipe. It’s not used for volumetric depth measurements, but to detect corrosion and provide go/no-go indications of pipe integrity. Time-of-flight diffraction (TOFD), which is arguably the most accurate of all ultrasonic inspection methods. While limited in pipeline integrity testing applications, TOFD can map girth weld preferential corrosion that can be masked by external weld profiles using other ultrasonic techniques. That leaves pipeline operators increasingly managing a combination of new and legacy assets, both of which present unique integrity inspection demands. Older pipelines can have laminations through entire pipe joints. Modern manufacturing practices make those kinds of defects rare, but no buried pipeline can be made immune from every potential problem. Newer pipelines have mill test reports with certified chemical and physical specifications. On older systems, carbon equivalency (CE) testing with optical emission spectrometry is used to obtain a positive material identification. CE percentage determines a pipe’s potential for cold cracking during welding, which is critical when repairing live loaded lines. Whether dealing with pipelines built five or 50 years ago, the NDT service provider must be methodical in searching for “symptoms” that could signify larger problems and identifying root causes. Smart pigs provide a good indication of what to anticipate, but NDT technicians should expect the unexpected and gather as much information as possible to give engineers actionable information for operational decision-making. 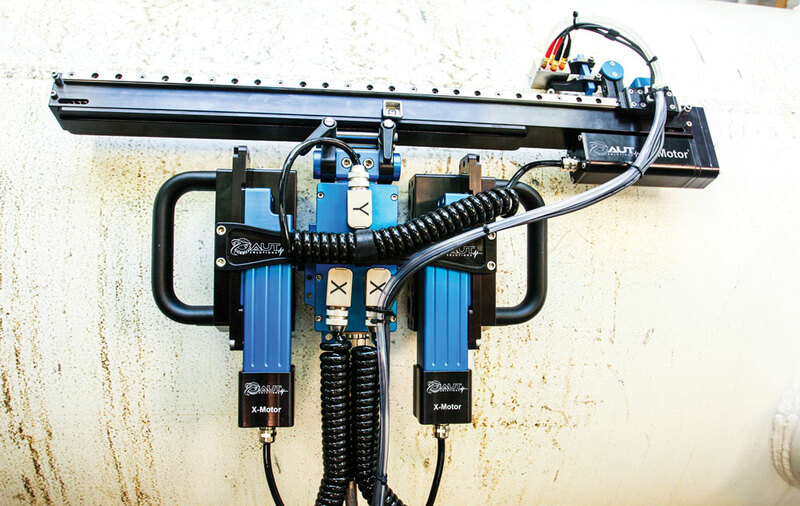 New tools are being introduced every day to help NDT technicians accomplish that task faster to minimize pipeline downtime, with better end results. 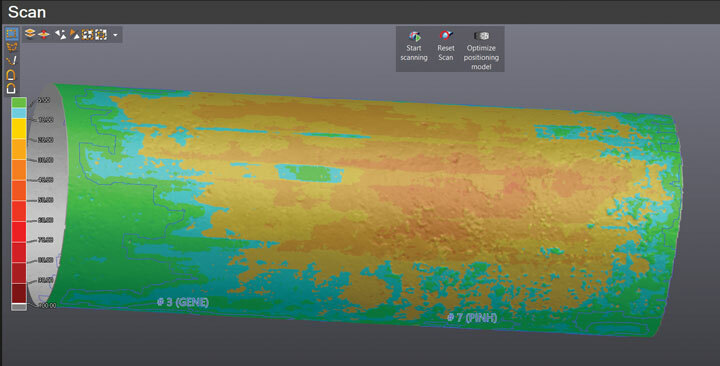 A case in point is 3-D laser mapping with dynamic referencing technology that generates exact digital replicas of the pipe and any material defects. While these kinds of technologies are enabling exciting new capabilities and efficiencies, they also challenge the NDT services provider to continually update inspection procedures and training programs to keep up with new developments and adapt to pipeline companies’ evolving inspection standards and ever-changing regulations. Pipelines can be dangerous assets. Periodically taking measure of their structural integrity is critical to safe operations. 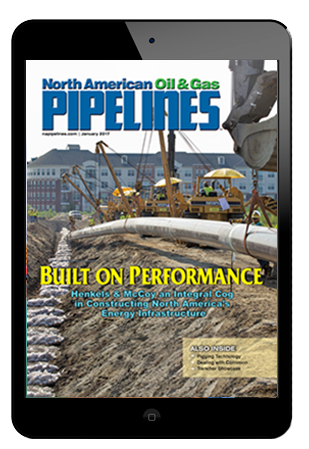 Cole Morehead is owner and president, and Eric Germann is pipeline integrity manager for Clifton, Kansas-based XCEL NDT LLC.